Merry-Joseph Blondel (1781–1853), Numa (1828), oil on canvas, dimensions not known, Musée d'art et d'histoire de Saint-Brieuc, Saint-Brieuc, France. Image by Gérard Yvergniaux, via Wikimedia Commons. Just as Lycurgus was believed to have provided Sparta with its laws and institutions, Numa (or Numa Pompilius) was claimed to have fulfilled that role for early Rome. Hence Plutarch’s match for his account of the Spartan is the largely legendary King of Rome who succeeded Romulus. It has commonly been claimed that Numa was a close friend of Pythagoras, something repeated by Ovid in Book 15 of his Metamorphoses. Plutarch recognises that this involves a chronological dispute, but passes over it without taking a side, merely affirming that Numa was undoubtedly of Sabine descent. He then gives a summary of the mysterious disappearance of Romulus, thirty-seven years after Rome had been built and Romulus had become its ruler. During the interregnum, each of the 150 senators acted as the ruler for a period of six hours in rotation. Eventually, the Roman and Sabine factions reached agreement that the Romans would choose a Sabine man to be the next king, and Numa Pompilius was agreed by both parties as the most acceptable candidate. Numa was a virtuous man who believed that reason should overcome passions. He had eliminated luxury and extravagance from his home, and as a result of his virtue and fame had married the daughter of Tatius, the previous Sabine co-ruler with Romulus. When Numa was invited to become the King of Rome, he declined, as he felt unable to contend with its repeated wars and strife, which he hated. The Romans appealed to him to reconsider, and he agreed to take the throne. When he went to the city, the people greeted him and voted unanimously for him to be crowned king. Numa, though, sought divine approval, for which he resorted to augury by birds, as Romulus and Remus had done long before. When the appropriately auspicious birds appeared, Numa donned his royal robes and became the king. Bernhard Rode (1725–1797), Augury (1768-69), etching, dimensions and location not known. Image by James Steakley, via Wikimedia Commons. 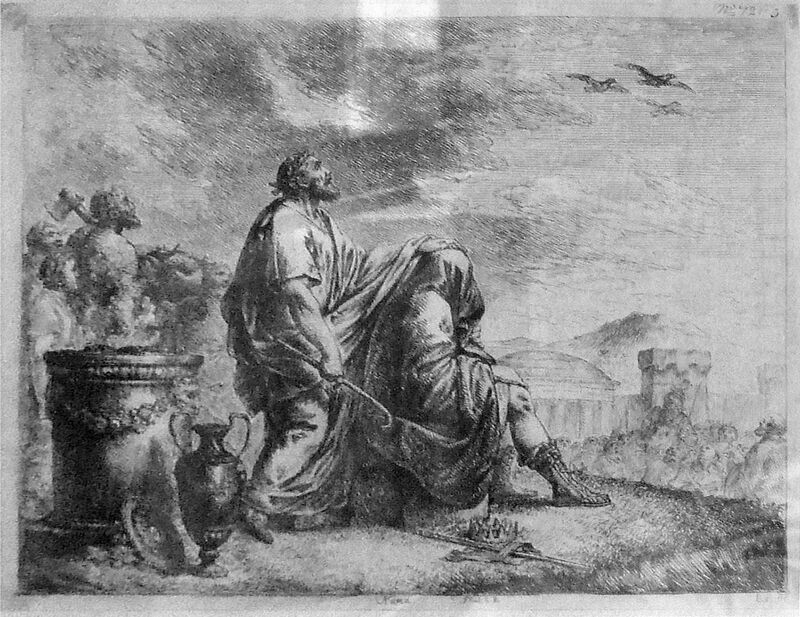 Bernhard Rode’s etching of Augury from 1768-69 shows Numa with an oracle determining whether the birds were propitious; the oracle stands watching the sky, as Numa sits, his head cloaked, waiting for the verdict. Alongside him is a crown and sceptre, symbols of his imminent elevation to the throne. Numa started his programme of reform by disbanding the three hundred close bodyguards which Romulus had kept. He added a third priest to the existing two of Jupiter and Mars, who was called Flamen Quirinalis. He then set about changing the harsh and warlike nature of the city and its citizens by means of religious rites. Plutarch attributes much of Numa’s approach to him being a follower of Pythagoras, and the changes which Numa brought to Rome and its citizens as being in keeping with the doctrines of Pythagoras. One example is that the new king forbade the worshipping of graven images – statuary or painted – of the gods, and that animal sacrifice was also banned in view of Pythagoras’ vegetarianism. A couple of times, Plutarch refers to a legend that Numa was in love with the nymph Egeria, although he does not mention the associated claim that the laws of Rome were dictated to Numa by that nymph. It is a story which has been quite popular with artists, though. Nicolas Poussin (1594–1665), Numa Pompilius and the Nymph Egeria (1631-33), oil on canvas, 75 × 100 cm, Musée Condé, Chantilly, France. Wikimedia Commons. 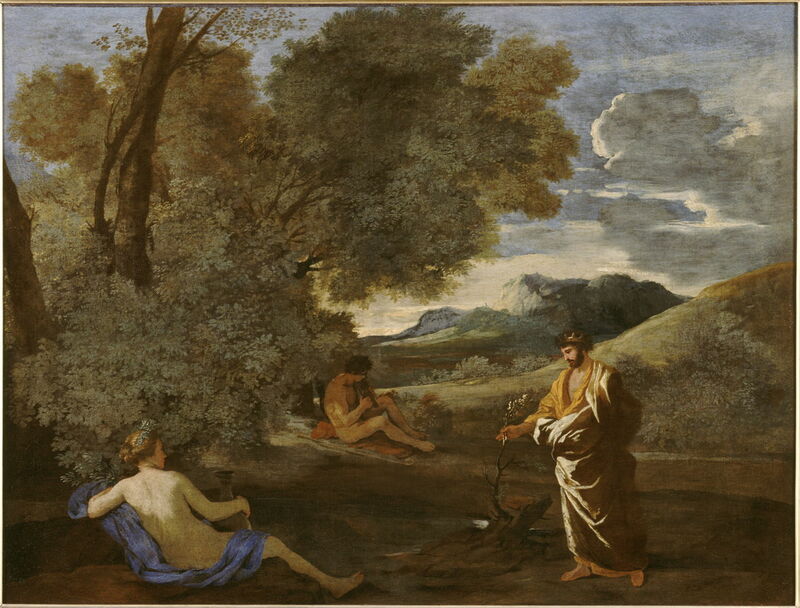 Nicolas Poussin’s Numa Pompilius and the Nymph Egeria from 1631-33 shows the meeting of King Numa, at the right, with Egeria, at the left, as she was being entertained by a young man with a lute, who may signify the Muses who apparently inspired Egeria to provide the laws of Rome. However, Numa hasn’t come equipped with any means of recording them, suggesting that this wasn’t the occasion on which Egeria dictated those laws. Felice Giani (1758–1823), Numa Pompilius Receiving from the Nymph Egeria the Laws of Rome (1806), oil on canvas, dimensions not known, Palazzo dell’Ambasciata di Spagna, Rome, Italy. Wikimedia Commons. Felice Giani’s much later painting of Numa Pompilius Receiving from the Nymph Egeria the Laws of Rome (1806) shows that process of dictation in full swing, with Numa working through scrolls, which are then transcribed onto the tablets of stone seen at the left. The nymph is the one sat on a throne, and is clearly in command, wagging her index finger at the new King of Rome. Ulpiano Checa (1860–1916), The Nymph Egeria Dictating to Numa Pompilius the Laws of Rome (c 1886), oil on canvas, 300 x 200 cm, Museo Nacional del Prado, Madrid, Spain. Image by Poniol60, via Wikimedia Commons. Ulpiano Checa’s The Nymph Egeria Dictating to Numa Pompilius the Laws of Rome (c 1886) offers a similar account, with King Numa sat writing down the laws on scrolls of paper using a reed pen. Egeria is quite different, though, and appears a simple and very naked nymph, in accordance with the linked legend of Numa and Egeria being lovers – which Plutarch denies. Numa established the order of high priests known as the Pontifices, and their chief, the Pontifex Maximus, terms which influenced the titles of the much later Christian church. Although the Vestal Virgins had already been cited in Plutarch’s biography of Romulus, Numa is attributed the institution of the temple of Vesta, the duties of its priestesses, and the penalties for any breach. Two other orders of the priesthood were established by Numa, including the Fetiales, whose duty was to guard the peace. If they were unable to settle a quarrel with an enemy, then they, not the king, were responsible for any decision to declare war. Numa’s solution to the division of Rome into two factions, Sabine and Roman, was to divide it further according to trades and arts, which he actively promoted. He also changed the calendar to keep it in better synchrony with the solar year, and re-ordered the months within it. Merry-Joseph Blondel (1781–1853), Numa (1828), oil on canvas, dimensions not known, Musée d’art et d’histoire de Saint-Brieuc, Saint-Brieuc, France. Image by Gérard Yvergniaux, via Wikimedia Commons. 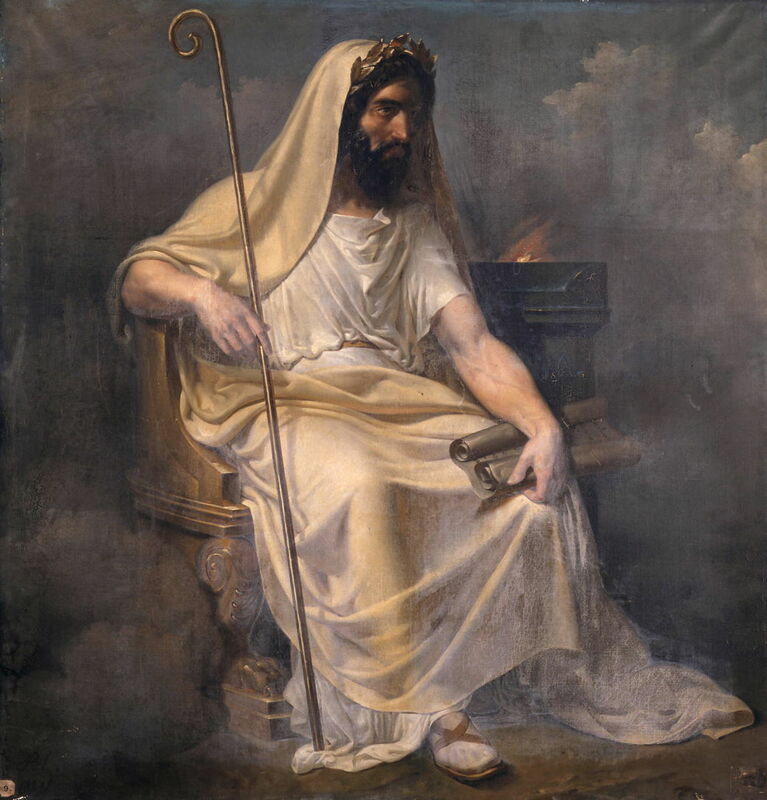 It is Merry-Joseph Blondel’s portrait of Numa from 1828 which is most in keeping with Plutarch’s account. Sat in a modest throne beside an altar, he is dressed as a priest, and holds a scroll of his new laws in his left hand. Plutarch accepts that there was much dispute over Numa’s personal life, including the number of his children, but asserts that he was over eighty years old when he died, and was mourned greatly. He was buried under the Janiculum in a stone coffin, with another coffin containing the sacred books which he is supposed to have written. Plutarch’s comparison between these two virtuous statesmen starts by pointing out that Numa accepted kingship, albeit reluctantly, but Lycurgus refused it. He draws a good metaphor by stating that Lycurgus tightened the strings at Sparta, but Numa loosened them in Rome. To achieve those changes, Lycurgus had to put his life on the line, and lost an eye in the process, whereas Numa was able to use persuasion. There were also marked contrasts in handling of their subjects: Numa was popular, favoured the masses and encouraged arts and crafts, but Lycurgus was rigid, dedicated single-mindedly to make Spartans warriors, and left non-military crafts to slaves and Helots. Sparta came to foster bold women who ruled their houses absolutely, but the women of Rome became accustomed to remaining in dignified silence. Perhaps the most revealing comparison was the later destinies of Sparta and Rome after moving on from these early laws: while the Romans only increased in power, Sparta collapsed, and was in danger of complete destruction. Numa’s change by persuasion brought a more enduring harmony. Posted in General, Language, Life, Painting and tagged biography, Blondel, Checa, Giani, history, morality, painting, Plutarch, Poussin, Rode. Bookmark the permalink.